Genesis is suitable for Chinchilla! Whiskey loves Genesis Alfalfa Ultra Premium Rabbit Food! If you do a quick search about Chinchilla diet, you will notice that some rabbit pellets are suitable for Chinchillas. In fact, in Malaysia, a particular local brand is actually a repack of the commercial rabbit pellets imported from USA. Inspired by that fact, we have been testing out Genesis Ultra Premium Rabbit Food on Chinchillas for the past few months. 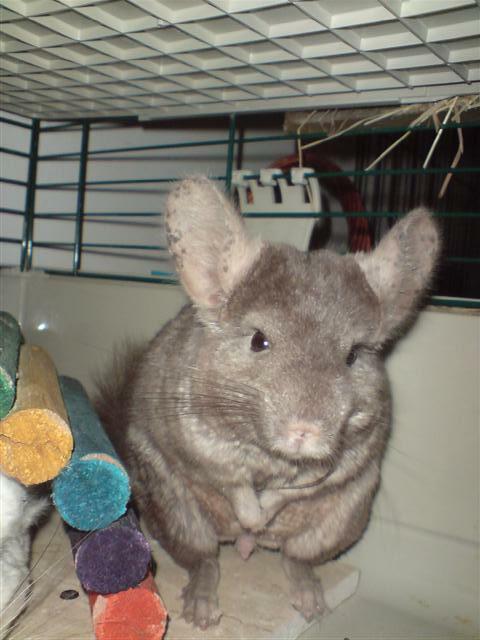 Whiskey (picture above) is one of the Chinchillas we have been feeding Genesis. The truth is, he LOVES it! His fur condition has improved as well giving yet another strong testimony how great Genesis is as THE rabbit food and now can be given to Chinchillas as well! Why feed rabbit food when there are chinchilla foods formulated specifically for chinchillas? Well, we’re going for ULTRA PREMIUM that’s why!